The most popular type of sushi today, nigiri-zushi originated as a fast-food dish in Tokyo. Consisting of a piece of seafood put onto a small ball of rice, it takes much less time and effort to prepare than more traditional sushi dishes. 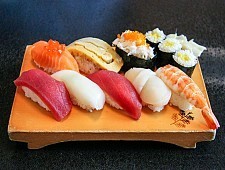 Nigiri-zushi are served at all sushi restaurants from inexpensive conveyor belt sushi to Michelin-starred restaurants. Tsukiji Fish Market is one of the best places to eat fresh sushi. Before the Edo Period, mainly vegetables were used for tempura, but Edo cooks started to deep fry seafood from Edo Bay in tempura batter, resulting in the more varied dish we know today. 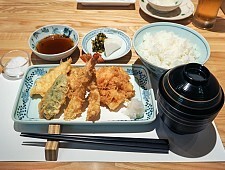 A visit to a specialized tempura restaurant (tempura-ya) is the recommended way to enjoy tempura. 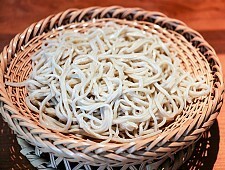 In Tokyo, they were particularly popular during the Edo Period, and can be found all across the city today, including at standing soba eateries and establishments specialized in soba (soba-ya). The dipping sauce used in Tokyo is traditionally relatively thick, and diners are encouraged to dip their noodles into it only lightly. Monjayaki is a type of runny pancake made of flour and water mixed with ingredients like sliced cabbage and small pieces of seafood and meat, which are then cooked on a hot grill. A small spatula is used to scrape some of the cooked monjayaki and eat it off the grill. 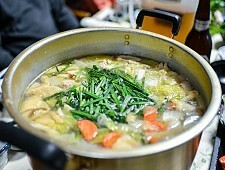 The “Monjayaki Street” in Tsukishima is the best place to eat the dish. Tokyo is home to various types of traditional Japanese sweets (wagashi). 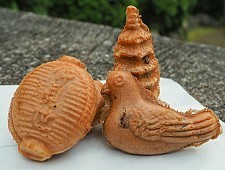 These include sweets such as ningyoyaki, small red bean paste filled cakes shaped like dolls or other forms; dorayaki, a pastry made of sweet pancakes with a layer of red bean paste sandwiched in between; and anmitsu, a dessert typically consisting of agar jelly, a scoop of red bean paste, small mochi balls and seasonal fruits topped with sweet black sugar syrup.